Ernest Enoch Hinshaw1,3,4,5 [Enoch Ernest Hinshaw3,6,7,8]. Hinshaw, Earnest E., head-of-household, age 34, born in Iowa; parents born in Iowa; first married at age 27; rented home; no radio in home; occupation: farmer, farm; World War I veteran. Hinshaw, Ruth A., wife, age 25, born in Texas; parents born in Tennessee; first married at age 19. Hinshaw, Ross E., son, age 6, born in New Mexico; father born in Iowa; mother born in Texas. Hinshaw, Newton B., son, age 5, born in Texas; father born in Iowa; mother born in Texas. Hinshaw, Floyd C., son, age 1 year 2 months, born in Texas; father born in Iowa; mother born in Texas. Annie died Jan 26 19978,9,10 [Jan 28 19976, Apr 26 19974]; buried Jan 30 1997, Section 3, Site 1478, Santa Fe National Cemetery, Santa Fe, Santa Fe County, New Mexico8,9,10. 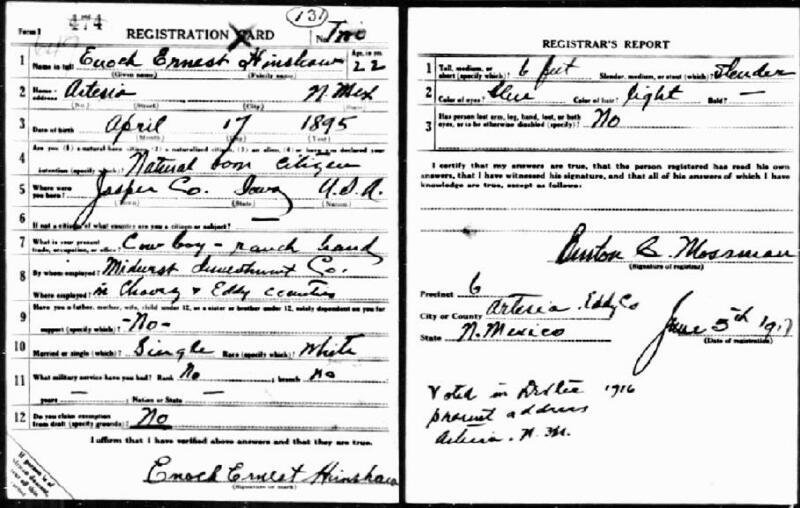 1930 census, Precinct 1, Borden County, Texas; roll T626-2289, ED 1, page 2A, line #29, dwelling #33, family #33. Contribution from Leslie Ernest Hinshaw. Contribution from Andrew Donn Hinshaw. 1910 census, Kenna Precinct, Chaves County, New Mexico; roll T624-913, ED 31, page 198B, line #74, dwelling #261, family #261. U.S. Veterans Cemeteries, ca.1800-2004; http://www.ancestry.com.